Yuba County resident Stanislaw Grzegorz Jarmolowicz had told his son several times to turn down his stereo, but did his son listen? Of course not. So, Jarmolowicz did what any normal, red-blooded, American father would do in that situation: he blew out the speakers with a shotgun. Arrested on "suspicion of shooting at or into a building," he was booked in the Yuba County Jail on Monday. However, since he made sure his son moved out of the way before firing, and since his son wasn't fearful of being shot, Jarmolowicz was released on Wednesday without any charges being filed. 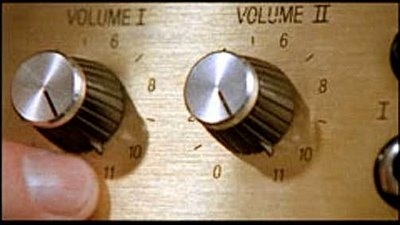 The police report didn't say what music was playing, nor did it mention whether the speakers went up to 11 or only 10. What's on Ben Bernanke's mind? Marker Magic: Fun in the snow! School renames Easter eggs "spring spheres"
Marker Magic: UFOs attack our neighborhood! Washington's idea of a "spending cut"
"Dead Poets Society": Where are they now?